The Sacramento Kings are still the Sacramento Kings. 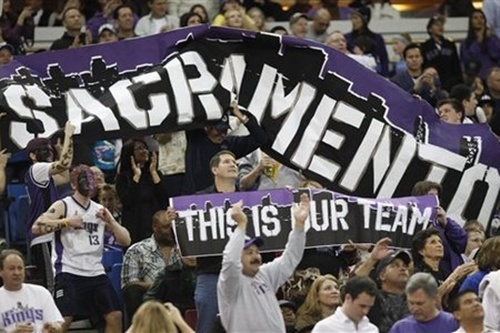 In a 22-8 vote in opposition of a relocation to Seattle, the Kings will be staying in Sacramento. Owners met for over four years Wednesday in Dallas to vote on whether the team’s 28-year history in California’s capital would continue. It will. After the vote was taken, it was noted by NBA commissioner David Stern that the proposed sale,headlined by Chris Hansen, had ended effectively. Stern also said that the current ownership group has the right to remain the owners of the team,but expects that a sale to the Sacramento group, headed by Silicon Valley executive Vivek Randive will go through. It is a very exciting time for Sacramento. Not only have they survived a threatened relocation to Anaheim but they also survived this one. Also, they have a potential ownership group who is determined to bring a winning tradition back to Sacramento and to do so in a first class facility at 5th and L Streets. The Maloof ownership group has run its course, it is time for them to sell to Ranadive’s group so they can get on with the rest of their lives and so that this franchise can flourish once more. As much as I would love to see Seattle have a team, they will have to wait their turn. Their efforts this time around were commendable. I do see them getting an expansion team sometime soon,maybe when the current television contract is up. It would be neat to see them and maybe another city in the East (Louisville?) get a team in a few years. I have heard that Vancouver and Las Vegas are also interested in getting a team,but I think we can all agree that it’s Seattle’s turn first to get a new team. It’s also Sacramento’s time to celebrate. To celebrate a new era of basketball and sports. To celebrate a soon-to-be revitalized downtown, to celebrate a victory that may be bigger than any of the victories they have had on the hardwood recently. I’ll say this,it will be awesome to go to that new downtown arena in a couple of years.